How Does a Kerosene Cooking Stove Work? Kerosene's relative cleanliness and efficiency compared to other liquid petroleum-based fuels make it an attractive alternative fuel. Small appliances such as space heaters and cooking stoves are well suited to kerosene power, and trading in a conventional electric or natural gas stove for a kerosene-fueled model allows a user to get off the mainstream energy grid, an advantage that has grown in appeal in an era of uncertain energy supplies. Most kerosene cooking stoves are either pressure or wick types. Kerosene is a hydrocarbon liquid distilled from crude oil. It burns relatively cleanly compared to other petroleum products such as gasoline and diesel fuel, producing fewer particulate pollutants and harmful vapors, and it is used in many industrial and commercial applications. Kerosene is the fuel most commonly used in aircraft jet engines, and it is used as a heating fuel, both in central heating systems and space heaters. It is widely used as a cooking fuel in countries such as India, and portable kerosene stoves are favored among those seeking alternative energy sources for their appliances. Cooking stoves powered by liquid petroleum fuels like kerosene usually require a mechanism that vaporizes the fuel and mixes it with oxygen for the fuel to burn efficiently. Once the fuel is vaporized, it is directed toward a dispersion plate or burner where it is ignited and forms a flame suitable for cooking. Stoves of this type require priming and preheating before they are ready to use. 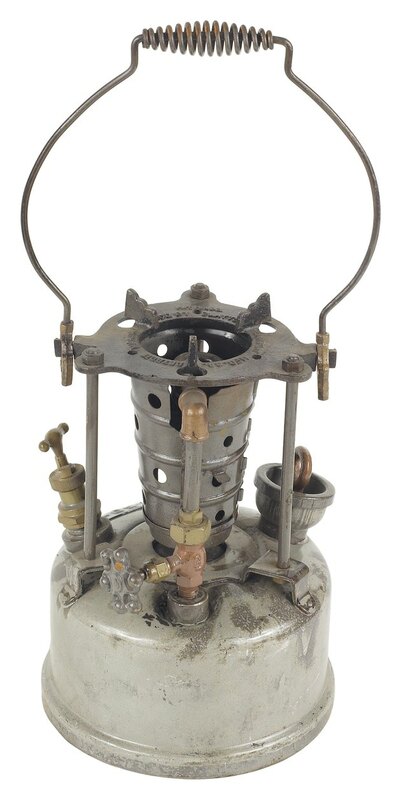 A typical kerosene pressure stove is fed fuel from a tank under pressure; fuel pressure is created by gravity, a hand pump or an electric pump. The stove is primed by igniting fuel in a priming pan on the stove; priming fuel is either introduced from the tank's fuel line or poured directly into the priming pan by the user. As the priming flame burns, it heats the fuel in the fuel line to its boiling point, and the fuel begins to vaporize. When a valve on the fuel line is opened, the vaporized fuel is forced through a jet toward the dispersion plate, mixed with oxygen drawn in through vent tubes and ignited by the priming flame to create the cooking flame. The flame continues to heat fuel in the fuel line, either via a loop of the fuel line that passes through the flame or a heat sink on the stove that maintains the proper temperature, and a steady supply of vaporized fuel is drawn from the tank to the jet. A kerosene wick stove works much like a candle. One end of a fiber wick rests in a reservoir of fuel, and fuel is drawn up through the wick by capillary action. A flame is applied to the other end of the saturated wick, igniting the fuel and drawing more fuel into the wick, thus maintaining the flame. Many kerosene cooking stoves have multiple wicks to provide a broader, hotter and more consistently heated cooking area. What Is a Barometric Damper? How Do Gas Stoves Work?